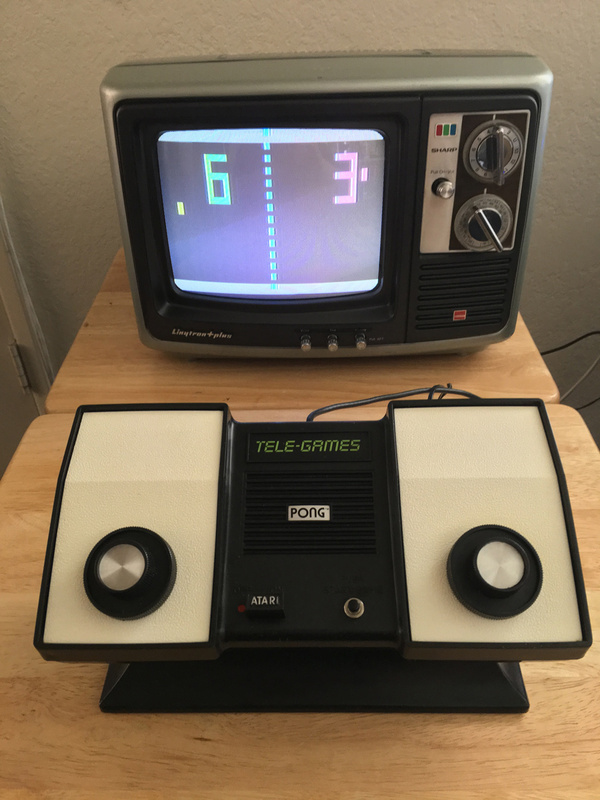 I wanted one of the Sears Tele-Games models, because those were the first ones sold (I have no idea of this one's actual manufacturing date however). This one is in amazing condition, especially considering its age. It works perfectly fine, there's almost no wear to speak of, and it just needed a little TLC with some Windex and a toothbrush to clean it up. The left pot needs a little contact cleaner, but it's not bad - just a little jittery. 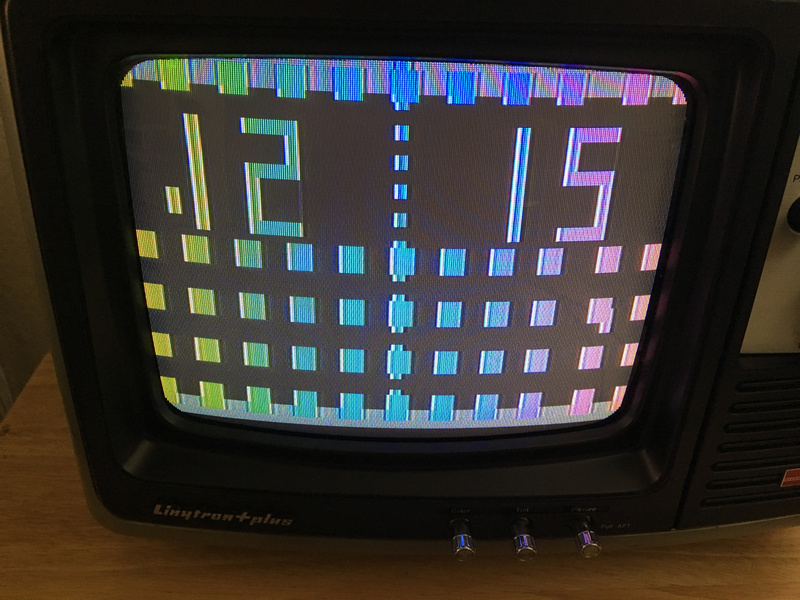 The picture is very crisp, especially considering it's running on a 35-year-old TV. And no - the score doesn't stay on the screen while you're playing. It only appears between serves. But the photos looked empty without it. I guess this was just a way to let you know the game had ended, and was probably something easy to display. Plus it adds a little pizazz to it. It also came with an original Sears Pong "Battery Eliminator" which is still the coolest name ever for an AC adapter. I think Radio Shack may have called them that, too. It's battery-powered. It seems strange now, but at the time it would've been marketed as an electronic toy, and all of those were battery-powered. But again, you could buy a "Battery Eliminator" for it. The speaker is built-in. No sound comes through the TV. Not sure why, except, again, it's effectively an electronic toy, so that would have been expected at the time. It just makes a couple of different beeps, and there's no volume control. I don't know when videogame consoles started using the TV for sound, but this better explains why there are unused speaker grills in the 2600. Anyway, it's a cool little conversation piece to have around, and it's still fun to play. And yes - it will be making an appearance in a certain Atari-themed comic strip at some point. So there is only 2 player Pong and no variations? I suppose it doesn't get much more retro than this. It has two variations: on and off. But yes - two-player Pong only. It's elegantly simple - the paddles are built-in, so you have to sit right next to your opponent, but that could add to the fun depending on who you were playing against. It has an on/off switch and a start button. That's all there is to it. The speed ramps up very well, and the onscreen paddles are a good size so it has a very balanced feel to it. They certainly spent some time dialing it in so it played well. The only way to get more retro would be to pick up an Odyssey. But I was after Atari's first home console. It's a neat piece of history. I thought the original home unit was black & white. Not Pong. The home version was always intended to be color. 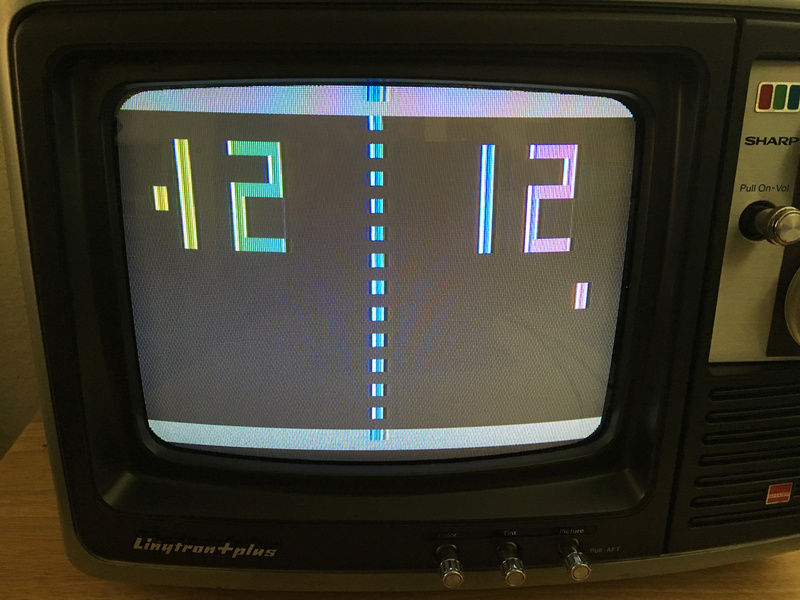 I need to dig out my Sears Telegames Pong again. It was missing the RF cable when I got it, but I got one put in as someone had left those cursed, three slot screws loose. Worked fine when I parked it at least. The color is interesting, it looks like they added the output of a custom 3.595 280 MHz crystal (colorburst + one extra cycle per line) to the normal black & white signal. Not sure why they decided to go with built-in speakers rather than adding the audio to the video output before modulating it for channel 3 / 4. Maybe a cost saving measure again - not sure what the extra modulation circuitry would have cost. There's a little discussion about how Pong did color in the Stella at 20 archives, but I couldn't tell you which tape it was on. Other than it was one of the ones at Nolan's house.